"The only source of knowledge is experience,"
After successful careers spanning more than 50 years in the telecoms, MVNO, media, technology and retail sectors the founder directors set up Graystone Strategy. Having worked in a variety of large companies and start ups, we recognised that there was a growing need for actionable business strategy advice that is grounded in years of practical experience rather than a more theoretical approach. 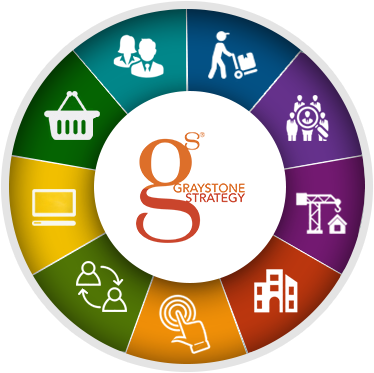 Our mission at Graystone Strategy is simple; we share our business experience, past mistakes and corporate scars to deliver practical and actionable business strategy that grows profit for our clients. We are an end-to-end consultancy offering services across the business lifecycle from the initial idea, to developing the proposition, building the product or service, taking it to market and growing the business. We have expertise in market analysis, segmentation, business case development, and customer research. You can draw on a wealth of experience as well as existing segmentation models and proven business assumptions to rapidly inform your proposition or business case. Whether you want help validating an existing proposition or building it from scratch our experts can help you build the right proposition and user experience for your customers. We have experience in negotiating multi-million pound deals with major brands and can advise on tactics, evaluate current commercial offers or help you to structure new commercial models to drive sales or manage risks. Whether you are seeking to mobilise your workforce, need to turn an idea into the next killer app or simply need to work through integrating with a network or new technology partner we have a team that can develop the right technology strategy and solution for you. Too many companies develop an amazing product only to see it fall short of expectations because their communications strategy lacks the targeting or simplicity to capture the hearts of customers. Our team of experts can help deliver the right strategy across PR, POS, advertising, direct marketing, social and digital media. Finding the right outlet for your product, managing the complex commercial, logistics and merchandising solutions required to distribute through owned channels or third party distribution is how we help our clients maximise their channel strategy. Clients can draw on our extensive experience of bringing complex products to market across different geographies, channels and media. We can help you build an end-to-end go to market plan and supply the resources to deliver it. Whether you are seeking interim resources for a new project, need assistance with building and developing your senior leadership team or need training solutions to ensure that the new product is understood and sold correctly we can deliver a solution. Once the strategising is complete the project needs to be delivered! We can supply experienced leadership, project management and business analysis resources to ensure that projects are delivered efficiently.